Dimensions: 4-3/8 x 6-1/4 x 2-1/2 in. Hinged box with lid, 5 dividing tabs, 100 different color postcards. 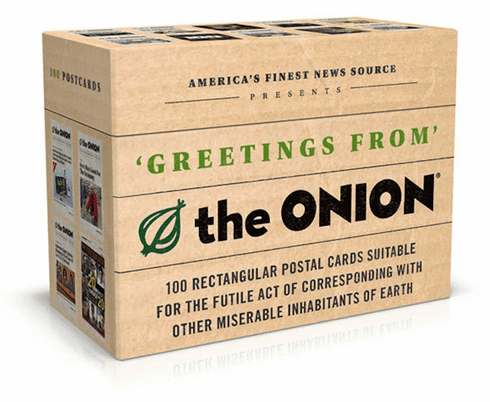 America's finest news source, The Onion, brings you this sturdy postcard box featuring 100 of the publication's best and worst headlines, magazine covers, and charts. These "rectangular" postal cards call out to bemailed, posted on the fridge, or otherwise shared. Five different category tabsLocal, National, Science & Technology, Sports & Entertainment, and Business keep the offbeat cards organized.